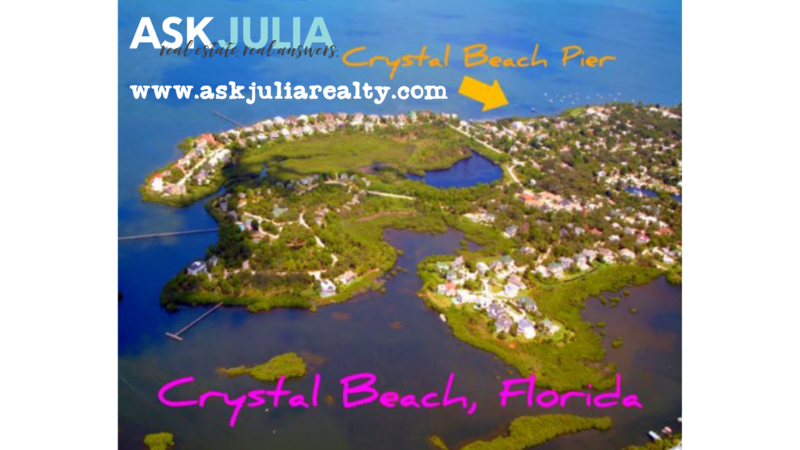 Crystal Beach Florida homeowners don't have mailboxes, but they have their own zip code - 34681. Residents pick up their mail at the tiny Crystal Beach post office - and that's just the way they like it. Mail delivery is not the only thing old-fashioned in this quaint seaside town. Within this community of about 1,200 people, you'll still find a sprinkling of old-Florida "Cracker Houses". Some of the streets remain unpaved and are covered with white seashells. Moss-covered trees and tall Oaks drape over many of the streets. There is no downtown here - the heart of this town lies within its residents. Originally a fishing village, Crystal Beach was officially developed in 1912 as a vacation village. It's grown a lot since then, yet Crystal Beach remains part of unincorporated Palm Harbor in Pinellas County. The famed Pinellas Trail runs through this community, which lies just south of Tarpon Springs and a dab of Palm Harbor and lies just to the north of Ozona and Dunedin, with Alt. 19 (aka Palm Harbor Blvd.) bordering to the East. Best of all, this community snugs up against St. Joseph sound and the sparkling Gulf of Mexico. The schools are magnificent - as is the case for all of Palm Harbor. In Crystal Beach, your young ones will grow up with the small joys of yesteryear. These include visits to the popular Crystal Beach Pier, a public fishing spot where, at high tide, you'll find brave kids jumping off the end of the dock into the warm waters. You can launch your kayak from the beach or take part in the many community festivities such as the Annual Chili Cookoff. At the north end of Town, there's Sutherland Bayou Boat Ramp, a 5-acre boating facility with direct access to the Gulf. You can also launch your boat at nearby Pop Stansel Park. Like OzonaFlorida, Crystal Beach is a golf cart friendly community, and it's lots of fun to leave the car at home. If you're a golfer, the renowned Innisbrook Golf and Tennis Resort is just up Alt. 19 about a mile. Although the name 'Crystal Beach' suggests that perhaps there are sandy beaches here, that's not the case, except for perhaps a few lucky homeowners on the sought-after Mayo Street or Point Seaside Drive. This is true for the majority of the developments in Northern Pinellas, yet the lack of sand is of little concern to residents. If it's glorious white sand beaches you're after, then the causeway to Honeymoon Island and Caladesi Island State Beach (just named one of the country's Top 10 Beaches by Dr. Beach), is just 3 short miles to the south. For the perfect adventure, you can ride your bike on the Pinellas Trail to get there. If you're thinking of making Crystal Beach home, you've got a wide variety of architectural styles and features to choose from. The median price range is about $400K with prices ranging from the upper $100's to $2M. Start your search here to see what's available, or contact me a personal tour. If you're just visiting, there are fabulous vacation rentals, too. Call or text me at 727.366.0324 or contact me here. You can also request a copy of my Tampa Bay Relocation Guide which highlights all of the splendor of Pinellas County and beyond.